NEW YORK — A hundred years ago, the sinking of the Titanic was a tragic disaster. Today, it's fodder for an entertaining outing with the kids. There are replica ships in Tennessee and Missouri, graveyard tours in New York and Nova Scotia, traveling exhibits from Las Vegas to Atlanta, and two brand new museums in Belfast, Northern Ireland, and Southampton, England. Hotels and restaurants are serving Titanic dinners, and ships are even heading to the disaster site — including an anniversary cruise that slashed prices last-minute from nearly $5,000 to $1,000. Here's a roundup of notable Titanic events and attractions here and abroad. TITANIC BELFAST: Titanic Belfast, an interactive attraction that tells the story of the doomed ship, opens March 31 in an ultra-modern building whose shape and silvery color evoke ship hulls on the water. Exhibits include 3-D projections, audiovisual displays, artifacts and even an indoor ride. A marine exploration center describes the work of Robert Ballard, who discovered the wreck of the Titanic on the ocean floor in 1985. Titanic walking tours and other attractions are also located in the new neighborhood, Titanic Quarter, that includes the defunct shipyard where the ocean liner was built, http://www.titanicbelfast.com/. SEACITY MUSEUM: SeaCity Museum opens April 10 in Southampton, England, the same day the ship departed from that port a century ago. The city lost 549 locals when the ship went down, mostly crew members. The new museum tells the story of Southampton's connection to the sea, with a focus on the Titanic story, including an interactive model of the ship and the London courtroom where an inquiry was later held. Southampton is about 90 minutes from London by train,http://www.seacitymuseum.co.uk/. CHERBOURG, FRANCE: The Titanic stopped in Cherbourg on April 10, a few hours after leaving Southampton, to pick up 281 passengers, including American Margaret Brown, whose ordeal as a lifeboat survivor was made into a movie, "The Unsinkable Molly Brown." Cherbourg's maritime museum, the Cite de la Mer, located in the port's 1933 Art Deco terminal, is opening an exhibit April 6 called "Titanic 2012," http://www.citedelamer.com/uk/ . Cherbourg is in Normandy, about 225 miles northwest of Paris. HALIFAX, NOVA SCOTIA: Ships dispatched from Halifax, Nova Scotia, recovered more than 330 bodies from the disaster site in the North Atlantic, and 150 are buried in three Halifax graveyards, including 121 at Fairview Lawn Cemetery. The city's Maritime Museum of the Atlantic is also home to an extensive permanent Titanic exhibit as well as special exhibits that will continue into the summer. Other events include ceremonies, tours, book talks, a concert, dinner theater, a photo exhibit, and even a Titanic toy model workshop, http://www.destinationhalifax.com/visitors/titanicevents. 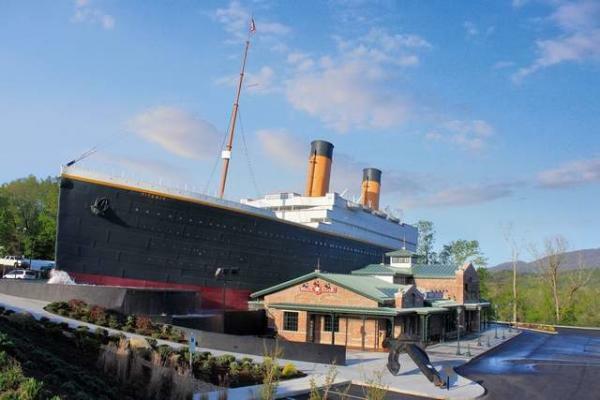 PIGEON FORGE AND BRANSON: It's a long, long way from any ocean, but Titanic museums in Branson, Mo., and in Pigeon Forge, Tenn., have hosted more than 7 million visitors since 2006 and claim to house some of the largest permanent collections anywhere of Titanic artifacts and memorabilia. The museums are actual half-scale replicas of the Titanic and are co-owned by John Joslyn, who was co-leader of the first private expedition to visit the shipwreck. Museum visitors get the boarding pass of a Titanic passenger or crew member when they enter, and at the end of the tour, they learn whether their passenger lived or died, http://www.titanicpigeonforge.com/ orhttp://www.titanicbranson.com/. Both museums will have special ceremonies April 14 marking the anniversary, and they're also sponsoring a Coast Guard cutter to take 1.5 million rose petals to the North Atlantic site where the ship sank. The cutter will leave Boston April 10 and joins several commercial cruises in the area for the occasion. MOLLY BROWN HOUSE MUSEUM, DENVER: More than three decades before Kate Winslet's fictional character Rose survived the Titanic in the 1997 blockbuster film, Hollywood made another movie about a real-life passenger who survived in a lifeboat, "The Unsinkable Molly Brown," starring Debbie Reynolds. Brown lived in Denver, and her home, a museum that tells the story of her life, offers special Titanic-themed tours: http://www.mollybrown.org . NEW YORK: The Titanic never arrived in New York but many New Yorkers were onboard and are buried here — both those who survived as well as those who perished. John Jacob Astor IV, said to be the richest man on the ship, is buried in Trinity Church Cemetery in Lower Manhattan. Woodlawn Cemetery in the Bronx is home to graves and memorials for 12 people who were onboard. Among them were Isidor Straus, owner of Macy's department store, and his wife Ida, who chose to stay with her husband rather than get in a lifeboat without him, http://www.thewoodlawncemetery.org/site/. Nine more are buried at Green-Wood Cemetery in Brooklyn including Douglas Spedden and his parents. When the Speddens were rescued by lifeboat, Douglas, then 6, lost a beloved teddy bear, which was later found and sent to him. The bear, purchased at FAO Schwarz, was manufactured by the famous German Steiff company, which then created a popular Titanic "mourning bear." Douglas died at age 9 after being hit by a car. His tombstone reads: "Titanic Survivor." A Titanic tour of Green-wood is sold out but you can visit the cemetery on your own, http://www.green-wood.com/. An eight-night Titanic anniversary cruise leaves New York April 10 headed for Halifax and the disaster site, where a memorial service will be held. Bookings were still available as of March 26, and prices for a windowless stateroom had been reduced from $4,900 to $999, www.titanicanniversarycruise.com/ . ELSEWHERE: Considering that the ship sank to the bottom of the ocean 100 years ago, it's remarkable how many Titanic artifacts (and replicas of artifacts) are on display in what seems like every corner of America. There's a Titanic Historical Society museum in Indian Orchard, Mass. ; a "Titanic — 12,450 Feet Below" show at Mystic Aquarium in Mystic, Conn., opening April 12; and "Titanic: 100 Year Obsession" opening at the National Geographic Museum in Washington, D.C., March 29, highlighting dives to the wreck site by Ballard and Cameron. The National Geographic exhibit will include replicas and props from the film as well as models of the ship, engine room and a radio room,http://events.nationalgeographic.com/events/exhibits/2012/03/29/titanic/. And from Premier Exhibitions, Inc., the company that brought you "Bodies: The Exhibition," Titanic exhibits are also on display at the Luxor Hotel and Casino in Las Vegas, the Natural History Museum in San Diego, The Henry Ford Museum in Dearborn, Mich., on International Drive in Orlando, at Union Station in Kansas City, at Marina Bay Sands in Singapore, and opening soon at Atlantic Station in Atlanta. Many hotels and restaurants are offering Titanic-themed packages and menus. The St. Regis Atlanta is hosting "100 Years & 100 Bottles," an April 10 reception featuring champagne, cocktails and hors d'oeuvres inspired by the last dinner aboard the ship. A $95, 10-course Titanic menu at the Blackfish restaurant in Philadelphia on April 15 includes oysters, squab and poached peaches. Molly Brown's great-granddaughter will attend a six-course Titanic-inspired meal April 14 at Denver's Oxford Hotel. If you can't make it to Belfast, Southampton, or even Pigeon Forge or Denver, don't worry. Your chance to take part in the anniversary is coming to a theater near you with the April 4 re-release of Cameron's movie, now in 3-D.